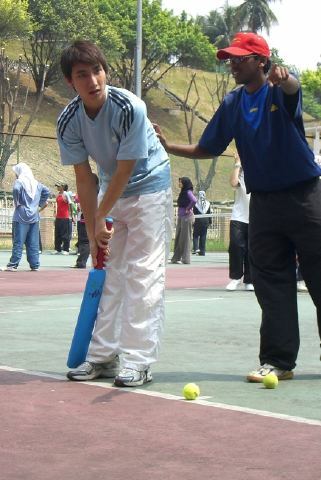 This whole week from Tuesday to Friday, 8am - 5pm, was spent with representatives from the Malaysian Cricket Association. They conducted an intensive Cricket coaching course & it was indeed a very fruitful one! We were also given a book as a resource for coaching & I dare say, it is a very very well written & illustrated book. "Successful Cricket Coaching: The Aussie Way" from the Australian Cricket Board. Cricket is a very technical & complicated game but once I got the hang of it, I loved it. Cricket is played on a large oval-shaped field with a "cricket pitch" in the middle. There are 2 opposing teams. One team will "field" while the other will "bat". After a few "overs", the teams will switch roles. The objective of the game is to score as many "runs" as possible. "Runs" can only be scored while a team is "batting". Lots of technical terms, eh? Basicly, this game is something like American Baseball. In cricket, the fielding team delivers a ball to the batsman of the batting team. The batsman will try to hit the ball as far as he can to give him as much time as possible to score as many runs as he can. To score a run, the batsman will have to from one end of the pitch to the other. He has to do this before the ball is returned from the field to the pitch. Cricket is truly a gentleman's game where the players take their time & there is no contact at all! It is not a game of brute force but a game of wit & skill. Truly a very suitable game for a conservative nation like Malaysia because men and women can play together without fear of harassment or injury. The highlight of the course was the cricket tournament where the course participants are divided into teams & put into a knock-out tournament. Everyone had a good time during the cricket course & I am very glad to have learnt a new game. My team won the tournament & the victory was hard earned. On the way to our victory, we were unprofessional in the Semi-Finals. On behalf of the team, I apologise for our unthoughtful words & ask for forgiveness. Let's put this behind us & look forward to future games where the players will conduct themselves in a civilised manner.